Toschi’s almond syrup is usually used to make drinks such as “almond milk”. I thought about using it to prepare cups of delicious desserts. I have an old apricot tree in my yard and every year we plan to cut it down because it produces few fruits that are mostly eaten by birds or other insects. This year’s its branches were unexpectedly full of perfectly ripe apricots and so the apricots gave me the idea for this recipe. Wash the apricots and cut them into 4 pieces. Keep the 4 pieces aside for the final decoration. Add the butter to a pan, add cane sugar, two tablespoons of Toschi almond syrup, (optional 1 tablespoon apricot liqueur). Bring the sauce to a boil and add the apricots, cook for 5 minutes then turn off the heat and keep the apricots in the pan. Working the mascarpone with the sugar, add egg yolks, and 3 tablespoons of almond syrup. Work with a whisk until the mixture is fluffy and inflated. Divide the apricots into 4 cups with their syrup. Place the mascarpone cream in each cup and top with a dollop of whipped cream. Toast the sliced ​​almonds in a nonstick pan for a few minutes. Distribute into the four cups. 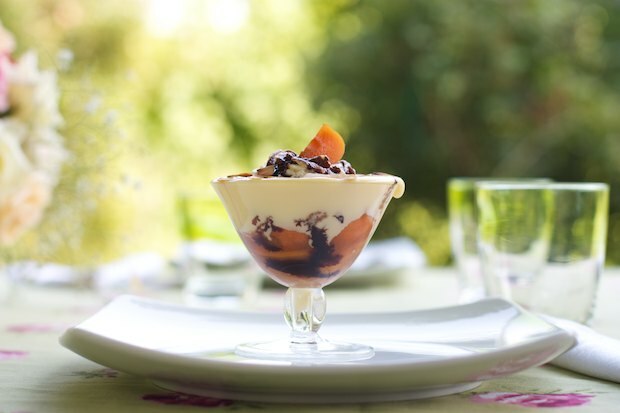 Pour a spoon of chocolate sauce over each dollop of whipped cream, and finish with a small piece of fresh apricot. Serve immediately.